A touring bike with a comfortable step-through and at the same time exceptionally sporty qualities. Low step-through? Doesn’t sound particularly sporty, does it? But with the Nevo, you’d be surprised. The striking silhouette, expansive frame profile and hard edges promise sportiness and determination. The positioning of the battery on the front of the lower tube makes the design redolent of a motorbike. In functional terms, this means a central arrangement of the centre of gravity, which produces neutral, safe handling in all riding situations. A touring bike with a comfortable step-through and at the same time exceptionally sporty qualities – the Nevo isn’t just the newest kid on the Riese & Müller block, it’s also an E-Bike of the future generation. Let the chopper off the leash. The design of the Nevo is based on the appearance of motorbikes. The position of the battery and the raised chainstay give it an especially sporty look. 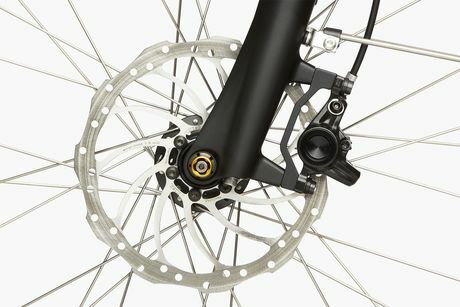 The chainstay also allows a version with a robust and easy-care carbon belt drive. Just like its bigger role model. The unusually sporty look of the Nevo makes it a very special touring E-Bike. The main reason for this is the innovative positioning of the battery on the lower tube. In addition to visionary design, this also has a functional purpose: the Nevo’s centre of gravity is arranged centrally, allowing neutral and safe handling in all riding situations. On the Nevo models, every detail delivers superb functionality. Even the design. The cables run hidden through the frame. Turns gravel tracks into freshly asphalted roads. Cobbles can be as difficult to negotiate as any route out in the wild. 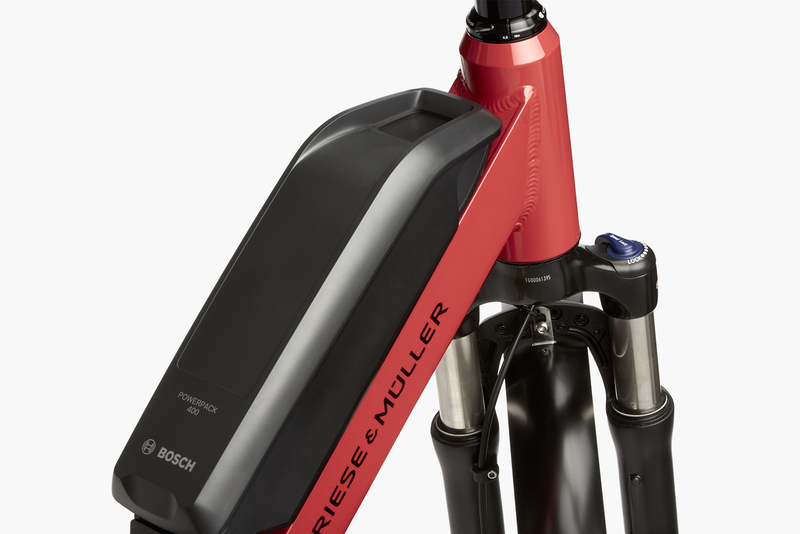 The suspension seatpost and sensitive suspension fork offer so much comfort that you’ll barely feel any bumps. Park your Nevo wherever you want. Only you can take it away. The frame lock clicks shut simultaneously with the battery lock, which means you only need one key for your E-Bike. Thick tires are for more than just showing off. When you go on a trip, you want to experience things. Those things don’t usually happen on well-travelled paths, but rather off the beaten track and away from the roads. That’s why we have equipped the Nevo GH and GT models (excluding 43 cm frame height) with wide, stable 27.5″ rims and Schwalbe Moto-X Fat Tires. The wide contact surface and reduced air pressure offer outstanding comfort and prevent the bike from sinking into soft ground, allowing you to conquer any unknown territory with confidence. Sets new standards for small body sizes. As from the 2018 model, the Nevo is available in a 43 cm frame height, suitable for body sizes from 1.55 to 1.70 m. It comes with matching 26″ tires which, at 55 mm, are a bit wider than their siblings for larger frame heights. For greater comfort and a superior ride. Ride with excellent road illumination at all times with the E3 LED headlamps from Supernova. Only daylight is brighter than their exceptional brightness. They are operated via the Bosch display, while the energy is supplied via the battery. Baskets and panniers can be secured to the carrier in no time, thanks to the “snapit” system from racktime. With just a click, your load can be changed quicker than a pit stop. Accessories can be obtained from your dealer. Suntrip 2018 13,500km Electric Bicycle Race!